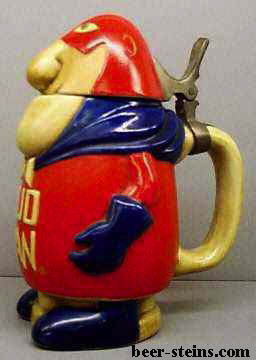 All steins are in excellent shape, unless otherwise noted. For your information, at least 13 variations, of the original Bud Man stein, have been identified, including differences in paint colors, thumbrest styles, hinge types and more. 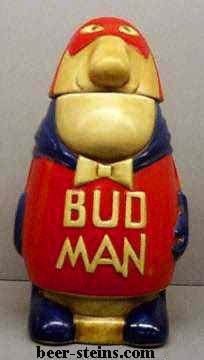 CS1A - Original Bud Man ® lidded stein. 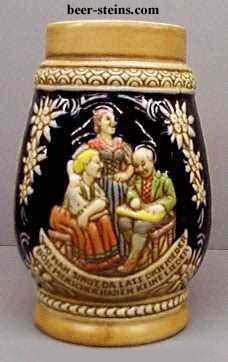 This 7 5/8" lidded stein was made in Brazil by Ceramarte. This is the Full Head variation. Dark Blue. Did not come boxed. This one has a different thumblift and has a R in a circle registered mark by N in Man. Also there is a knot in the bowtie. and the CSL2, which is also below. Pictured are the 2 variations of the CS4. CSL9-2 - Pre 1980 Lidded stein - 5 7/8" - CER - Smooth lid - cases & barrels. 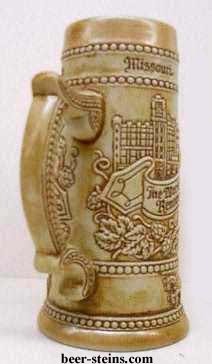 St Louis,MO in BLACK print & Budweiser ® Champion Clydesdales incised. Dark brown in color with wear on lid. 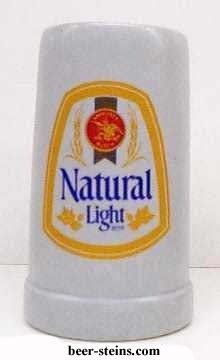 These were the only legitimate Bud Girl steins that were produced by Ceramarte for Anheuser-Busch. These four have raised relief decorations around each Bud Girl. 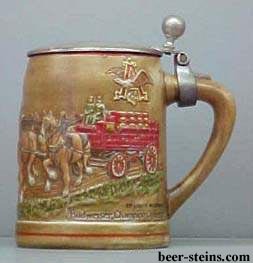 Any other fake steins were flat wall steins, with no relief, that were made with labels applied with a heat transfer machine. 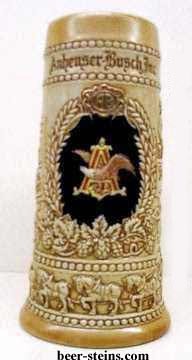 These bogus steins come in a short or tall version and are being sold as Anheuser-Busch steins. 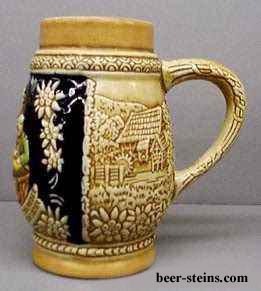 The only other legitimate Bud Girl steins that are ok were ceramic gift shop steins (white or blue), pitchers or very large steins that were made in the USA for Anheuser-Busch's Brewery gift shops around the country.